While the garden is being designed all the plants are still in pots and so at this time of year it is about checking what has done well, what needs attention and what needs binning. It is a sad reality of keeping succulents in cold climates that often more damage appears when things start to warm up. Just when you think most plants survived and you only lost a few, suddenly more start to go downhill. I have been fairly lucky this year with only a couple of loses: the cristate aeonium, and my large aeonium nobile being the only two I actually care about. 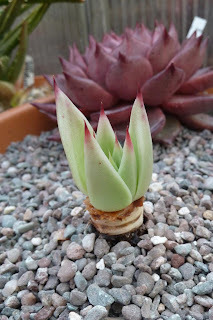 Recently one of the echeveria agavoides 'Ebony' suddenly took a turn for the worse and I have had to remove the majority of the leaves. 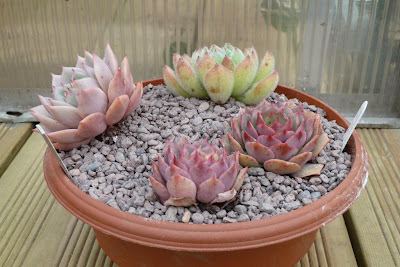 Hopefully it will recover, it would be a shame to loose it as the bowl of different e. agavoides forms was looking good at the end of last summer. I was looking forward to them filling the bowl by the end of this year. Everything else currently looks healthy and apart from removing a few dead leaves and some re-potting, they need very little work. The lovely weather over the weekend gave me a chance to get things going in the greenhouse and it was even warm enough to place a few plants outside to start hardening them off. I am determined this will be the year I avoid all scorch on my plants, the software leaved succulents are particularly prone. Each day the plants will be place outside for a bit longer, until they can cope with a full day in the sun. The cacti are mainly proving to be tough little things, all the main plants suffered no damage at all this year, and it seems that keeping them dry is all I need to do, which is very pleasing. 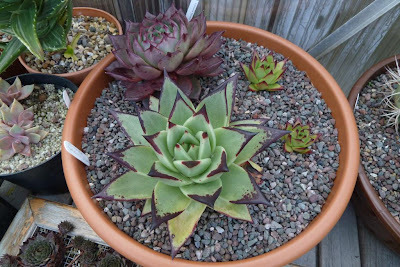 I did loose a couple in one of the bowls but I have enough other plants to re-plant it and they were selected more for the look than any promise of being hardy. Next was getting started on potting on a few plants. 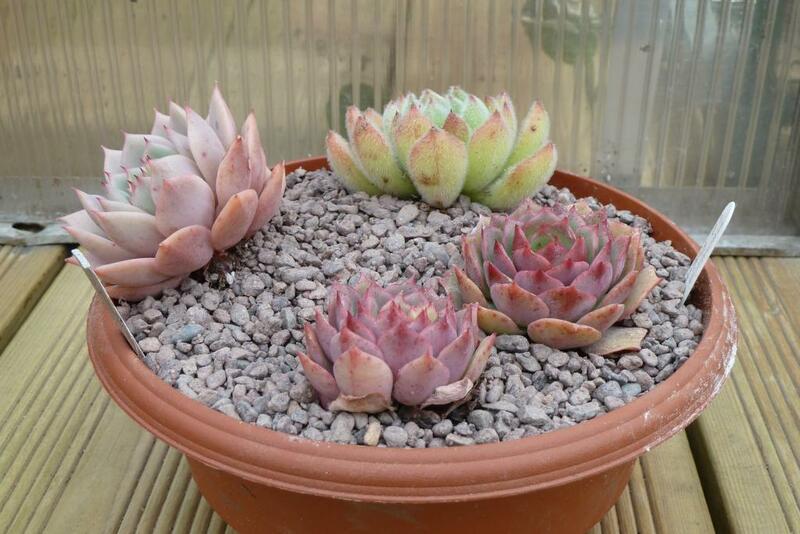 The larger "bowl" pots are becoming more available now, I have been making the most of them to do a few groups of plants. 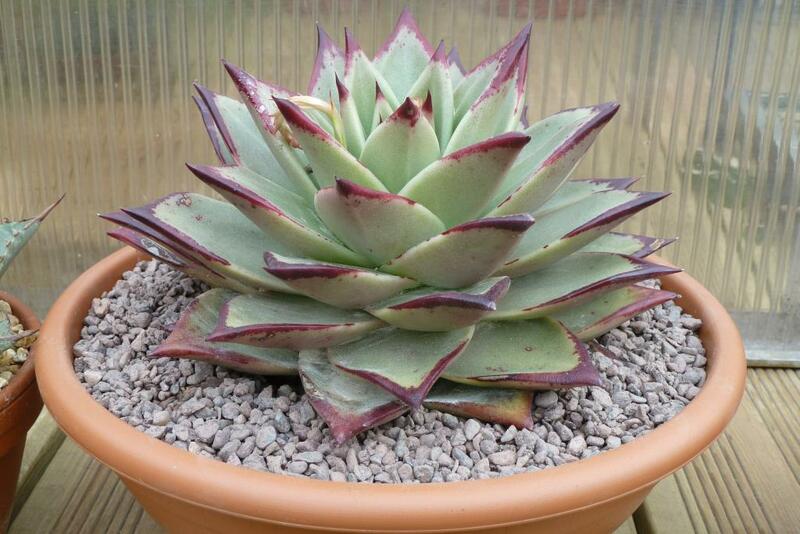 This one contains a group of echeverias that have been sitting around for a while. Time to give them a bit more space and see what happens. Does anyone else notice that for no apparent reason certain plants do much better than others? I guess it works the other way as well and we have certain plants that just don't grow. Echeveria agavoides usually does well for me. I have a few different forms now and they seem to get proportionally bigger than other echeverias; probably something to do with the fact they get left alone to get on with it. One of my e. agavoides 'Ebony' is now the biggest of all the forms and I had to move it into an even larger bowl. It is a bit pale at the moment after the winter, but a few weeks of heat and sun will improve the darkness on the leaf margins. It is great to get started potting up again, there isn't going to be the time to pot everything this year, but any free time is going to be spent outside getting everything back into shape after last years neglect. The greenhouse and cold frame are both giving the plants a bit of extra heat to kick start them into growth, something that is much needed in our cold spring. "Just when you think most plants survived and you only lost a few, suddenly more start to go downhill"...I know this feeling! It's very disheartening. I can also sympathize with your vow to not let your plants get scorched by the sun. No matter how hard I try there are always a couple of accidents. The problem with having so many plants in pots that you move around, there are always a couple you forget above and move too quickly. Maybe this will be the year for both of us. Have you ever experimented with shade cloths? We have the same problem here in 'sunny' [ha] Alberta - and I inevitably burn some to a veritable crisp. 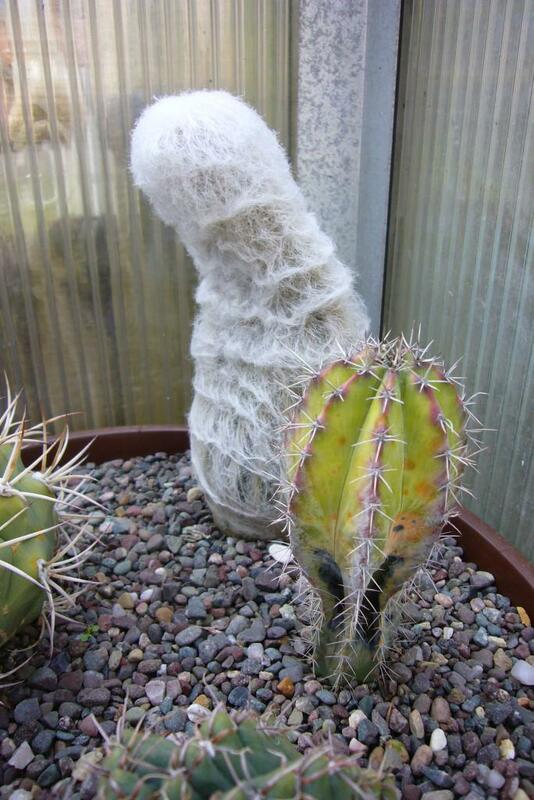 Also, do you ever have trouble with brown rust mold in the spring on your cacti? Thanks! I haven't used shade cloth as in the Uk the sun is only a problem when you first put plants out after being inside for a long time. And not come across brown rust mold yet. Not sure it is a UK thing or just me. "The problem with having so many plants in pots that you move around, there are always a couple you forget above and move too quickly." I couldn't agree more. I wonder why this happens almost everytime, probably it is because of excitement about spring..
Yep it is easy to get carried away with the fun of being back in the garden again.